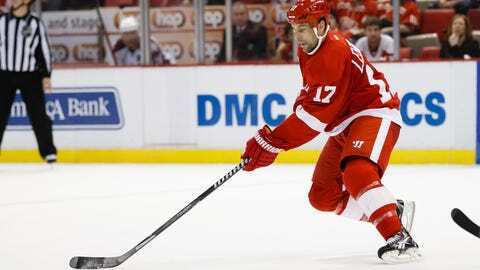 When the Wings acquired Grosse Pointe, Mich. native David Legwand from the Nashville Predators at last week's trade deadline, that meant they had five players on the roster who were either born in Michigan or raised here. DETROIT — Swedes have dominated the Red Wings for many years, but they might have to watch out for an up-and-coming group. When the Wings acquired Grosse Pointe, Mich., native David Legwand from the Nashville Predators at last week’s trade deadline, that meant they had five players on the roster who were either born in Michigan or raised here. 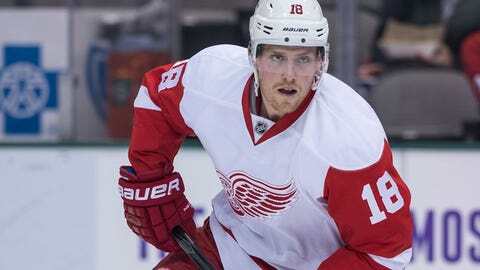 Justin Abdelkader was born in Muskegon, Luke Glendening in Grand Rapids and Danny DeKeyser in Detroit. Drew Miller was born in New Jersey but was raised in East Lansing and attended Michigan State University. Abdelkader also went to MSU. The previous high was in 2010-11, when the Wings had four players born in or raised in Michigan. If you play center for the Red Wings, the odds appear to be against you this season. "It’s pretty unique," Miller said. "I don’t think there’s many teams in the NHL that have (that many) guys that are on their team from their own province or state. I think we’re all kind of spread out in different ages so none of us really played with or against each other. I played with Abby at Michigan State for one year. I think that’s about it." Legwand is the oldest at 33. Miller is 30, Abdelkader is 27 and Glendening and DeKeyser are both 24. Glendening played at Michigan but he said that the Spartans, Miller and Abdelkader, have been great to him. "They’ve been able to put that aside, for the most part," Glendening said. "I still get a little razzing on game days but it’s been great and I think Michigan’s been dominating all the sports so far this year, except football. I think for the most part it’s been pretty quiet." There are four forwards and one defenseman among the Michigan group, so the Wings would have to acquire another defenseman if they wanted a five-man unit. "That would be cool," DeKeyser said. "Kind of like the Russian Five, but the American Five or something like that. "The Michigan Five, that works." Although they may be divided when it comes to college loyalties, all five of the players from Michigan grew up as Red Wings fans. "It’s more of a dream come true than most guys will live out," Glendening said. "Playing in the NHL is obviously a dream come true, but being able to play for the team you grew up rooting for is even better." Legwand, who had spent his entire career in Nashville, was willing to waive his no-trade clause to live that dream. "I think every kid growing up here is a Red Wings fan, as they should be," Legwand said. "The tradition, the history, the players that have been here from the past, they’ve meant a lot to the city and to the team. "Being somewhere for 15 years is tough, but to come home and have a chance to play in front of friends and family day in and day out, it’s exciting." Despite the growing number of hometown guys, the Michigan players have a ways to go to catch up to the Swedes, who have nine on the Wings roster. "I think they’re trying to figure out if we’re for real or not," Miller said. "We gotta recruit maybe a couple more to go after them." Captain Henrik Zetterberg, Daniel Alfredsson, Johan Franzen, Joakim Andersson, Gustav Nyquist, Jonathan Ericsson, Niklas Kronwall, Jonas Gustavsson and Mikael Samuelsson are the nine current Swedes on the roster. "It’s a takeover," Glendening joked to his locker neighbor, Nyquist. Nyquist just laughed at the notion, saying, "Us Swedes, we’re very welcoming of other people so we enjoy having those guys." Knowing just how important those nine players are, Glendening didn’t seem to mind being outnumbered. "Don’t want them to go anywhere." he said.